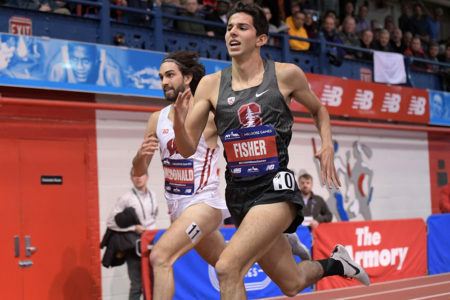 New York City, January 25-26—A battle for the world indoor best in the 4 x Mile relay highlighted the pro side of the Armory’s Sander Invitational. 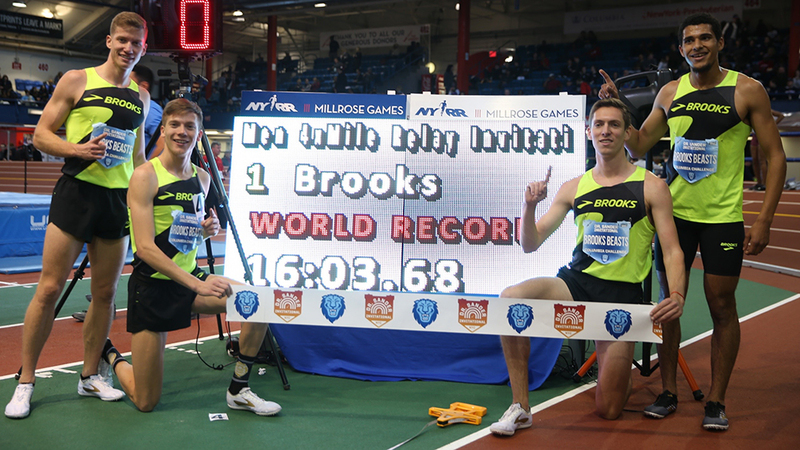 The Brooks Beasts faced off against the Hoka New Jersey/New York TC in a tight duel to go after the latter’s ’17 standard of 16:12.81, set on the same track. After 30 deadlocked laps, Brooks anchor Izaic Yorks blasted the final 400 to secure the win and smash the record in 16:03.68. 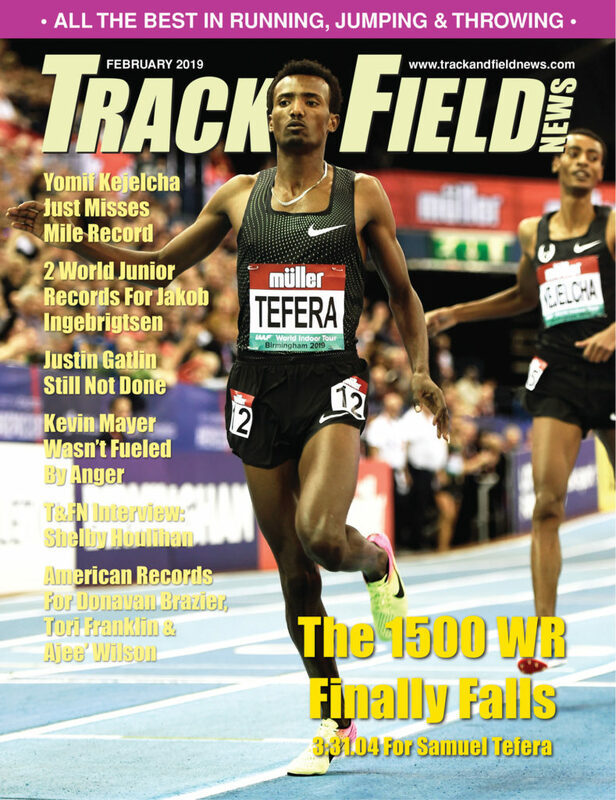 The time also crushed the absolute American Record, 16:08.54 run outdoors by Athletics West in ’84. The Seattle-based quartet had been focusing on the record attempt since October, and knew that it would require a push from their East Coast rivals. “It’s difficult to get a team of four healthy to the line, let alone two teams that can push each other,” Kidder said. “I think that’s the biggest difference today.” The Hoka squad (Jesse Garn, Travis Mahoney, Rob Napolitano and Ryan Manahan) finished in 16:16.05. Ajee’ Wilson (1:25.91) pulled away from Olivia Baker (1:26.75) over the final half lap to win the women’s 600, while Craig Engels (2:18.98) used a similar tactic to hold off Johnny Gregorek (2:19.78) in the men’s 1000. 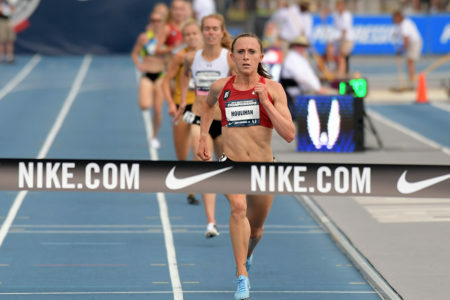 Amanda Eccleston (8:56.68) withstood a closing surge from Heather Kampf (8:56.87) in the women’s 3000, as both finished ahead of standout prep Katelyn Tuohy (9:01.81), who broke the HS Record in her first race against pros. In the college competition (dubbed the Columbia Challenge), top marks went to UCLA frosh Sondre Guttormsen, who cleared 18-8 ¾ (5.71) to win the pole vault and set a Norwegian indoor record, and the Villanova women’s DMR, which clocked 10:59.98 thanks to a 4:31.35 anchor from Nicole Hutchinson. 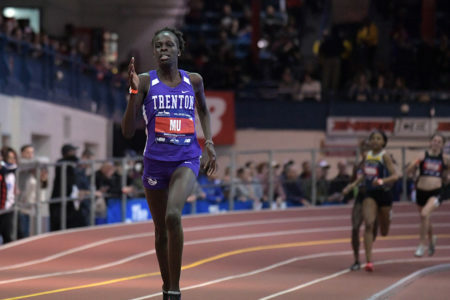 The Canadian senior also won the invitational mile in 4:33.47. The BYU men and Ohio State women won the team titles. Teams: 1. BYU 89; 2. Ohio State 81; 3. UCLA 79; 4. tie, Columbia & Virginia 56. 200: 1. ***Eric Harrison (OhSt) 21.15. 300: 1. Marcus Chambers (Nik) 33.28; 2. Dontavius Wright (US) 33.42. 600: 1. Byron Robinson (adi) 1:16.65; 2. Erik Sowinski (Nik) 1:16.75; 3. Michael Cherry (Nik) 1:17.19; 4. Edose Ibadin’ (Ngr) 1:17.53; 5. Chris Giesting (HokaNJNY) 1:18.77. 1000: 1. Craig Engels (Nik) 2:18.98; 2. Johnny Gregorek (Asics) 2:19.78; 3. Quamel Prince (DistTC) 2:20.05; 4. Robby Andrews (adi) 2:21.28; 5. Jeremy Hernandez (HokaNJNY) 2:21.79. 5. Sam Atkin’ (GB) 7:52.13; 6. Sydney Gidabuday (Adams) 7:54.77; 7. Graham Crawford (HokaNJNY) 7:56.35; 8. Julian Oakley’ (NZ) 7:56.50. Open 3000: 1. *Robert Brandt (UCLA) 7:59.11; 2. Brian Zabilski (Col) 8:02.15. 60H(1/25): 1. 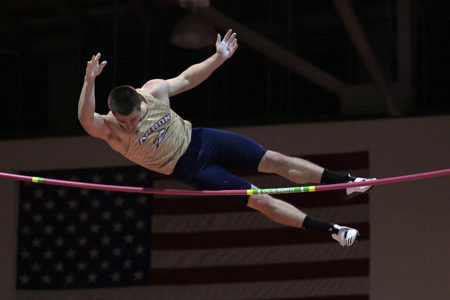 **Trey Cunningham (FlSt) 7.53 (=9, x C; =7, x AmC). 4 x 400: 1. South Carolina 3:09.84. DisMed: 1. Columbia 9:38.93; 2. Duke 9:41.88; 3. Oklahoma 9:42.44; 4. UCLA 9:44.61; 5. Virginia 9:45.55. 2. HOKA New Jersey/New York TC 16:16.05 (3 A; in/out: 8 A) (Jesse Garn c4:04, Travis Mahoney c4:03, Rob Napolitano c3:58, Ryan Manahan c4:11). 2. Cole Gorski (OhSt) 17-6½ (5.35). TJ: 1. *Jordan Scott’ (Va) 53-11 (16.43). SP: 1. 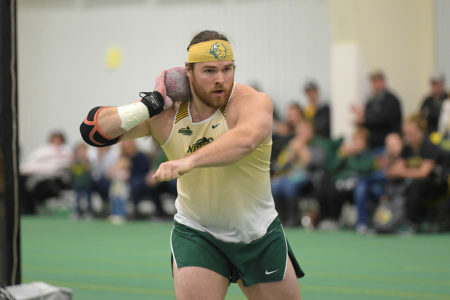 Joe Kovacs (VelNYAC) 68-1¾ (20.77); 2. David Pless (Iron) 65-4 (19.91); 3. Dotun Ogundeji (UCLA) 64-½ (19.52); 4. Jiaxiang Wu (Chn) 63-6¼ (19.36); 5. Curtis Jensen (Iron) 62-5¼ (19.03). Coll SP: 1. *Eric Favors (SC) 63-7 (19.38); 2. Ogundeji 62-6¾ (19.07). Wt: 1. Justin Stafford (UCLA) 67-5¼ (20.55). Hept(1/24-25): 1. Curtis Beach (unat) 5448; 2. Daniel Golubovic (unat) 5433. Teams: 1. Ohio State 74; 2. Duke 67½; 3. tie, South Carolina & Villanova 59; 5. Florida State 57. 60: 1. **Jayla Kirkland (FlSt) 7.28; 2. **Ka’Tia Seymour (FlSt) 7.30. 3. Maya Stephens’ (Can) 37.69. 400: 1. *Wadeline Jonathas (SC) 53.46. 2. Olivia Baker (US) 1:26.75; 3. Cecilia Barowski (HokaNJNY) 1:27.71; 4. Chrishuna Williams (Nik) 1:27.93; 5. Maddy Price’ (Can) 1:28.54. 800: 1. Allie Wilson (Monm) 2:06.58. 1000: 1. Natoya Goule’ (Jam) 2:37.55; 2. Laura Roesler (Nik) 2:38.11; 3. Claudia Saunders’ (Fra) 2:38.95; 4. Shannon Osika (Nik) 2:40.16; 5. Jenna Westaway’ (Can) 2:40.61; 6. Angel Piccirillo (Juventus) 2:41.41; 7. Stephanie Schappert (HokaNJNY) 2:42.97; 8. Síofra Cléirigh Büttner’ (Ire) 2:43.41; 9. Kenyetta Iyevbele (HokaNJNY) 2:46.67. Mile: 1. Nicole Hutchinson’ (Vill) 4:33.47 (4:15.36); 2. Karisa Nelson (Samf) 4:34.81 (4:16.20); 3. Dani Aragon (HokaNJNY) 4:34.87 (4:15.54); 4. Lianne Farber (NBal) 4:38.12; 5. Jamie Morrissey (HokaNJNY) 4:38.36; 6. Katelyn Ayers’ (Can) 4:38.47; 7. Anna Shields (PtP) 4:39.74. 4. Eleanor Fulton (US) 9:06.09; 5. Amy Eloise-Neale’ (GB) 9:16.44. 60H: 1. *Cortney Jones (FlSt) 8.14; 2. *Ashley Miller (FlSt) 8.26; 3. ***Morgan Lewis (OhSt) 8.35. 4 x 400: 1. South Carolina 3:37.19. DisMed: 1. Villanova 10:59.98 (Rachel McArthur 3:25.76, Amari Onque-Shabazz 55.75, McKenna Keegan 2:07.12, Hutchinson’ 4:31.35); 2. Monmouth 11:15.64; 3. Columbia 11:22.74; 4. Temple 11:23.03. HJ: 1. ***Sanaa Barnes (Vill) 5-11½ (1.82). PV: 1. Bridget Guy (Va) 13-9¼ (4.20); 2. Elleyse Garrett (UCLA) 13-9¼; 2. *Laura Marty (Duke) 13-9¼. LJ: 1. Kate Hall (unat) 21-4¾ (6.52); 2. Tristine Johnson (unat) 20-5 (6.22). SP: 1. **Alyssa Wilson (UCLA) 56-6¾ (17.24); 2. Ashlie Blake (UCLA) 55-5 (16.89); 3. Sade Olatoye (OhSt) 53-8¼ (16.36); 4. *Meia Gordon (Ok) 52-11 (16.13). Wt: 1. Olatoye 75-2½ (22.92).